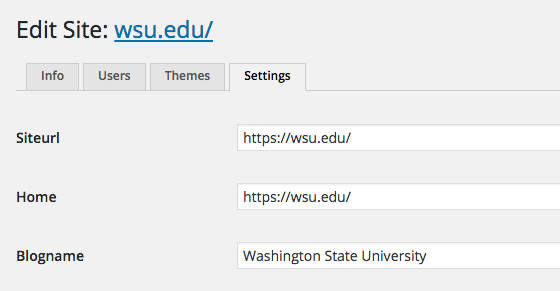 This is a brief rundown of the method we’re currently using at WSU to manage mixed HTTP/HTTPS configurations in a multi-network WordPress setup. Sites that are HTTP (HTTPS optional) on the front end should be forced HTTPS in any admin area. Some sites should be forced HTTPS everywhere. This may be because of form inputs or because it’s a nice thing to do. New domains may not immediately have certificates. We can measure risk and provide brief HTTP admin support—usually with trusted users on a wired network. To force HTTPS in admin areas, we use the WordPress constant FORCE_SSL_ADMIN. To determine whether this can be enabled, we start with the assumption that it should and then check for a stored option attached to the currently requested domain telling us otherwise. A bit further down, we use this information to actually set the constant. This option is managed through our WSUWP TLS plugin, which tracks new domains and allows non server-admins to start the process of CSR generation and certificate upload. Once the domain goes through the entire process and is verified as working, the foo.bar_ssl_disabled option is deleted and admin page loads will be forced to HTTPS. Forcing HTTPS everywhere is much easier, as we can redirect all HTTP request for a domain to HTTPS in nginx (or Apache). At that point, we’ll set siteurl and home for the site to HTTPS as well so that WordPress generates HTTPS URLs for everything. In a nutshell. Assume all admin requests are HTTPS, but have a config flag that allows you to offer temporary HTTP access. If a domain can be forced HTTPS everywhere, then handle that in the nginx/apache config. "A Method for Managing Mixed HTTP/HTTPS Sites in Multisite" by Jeremy Felt, unless otherwise expressly stated, is licensed under a CC BY-SA 4.0 International License.